Troy 8150 MICR / 02-81023-001 / Troy 8100 MICR (C4182X) - Genuine New - Print your own checks with this Genuine New Troy MICR 8150 MICR Toner. This Troy 8100 MICR Toner helps prevent against fraud protection with Secure MICR Toner. 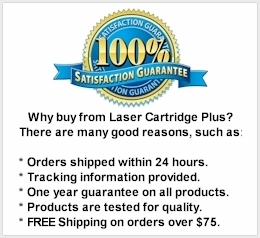 For use in Troy MICR 8100, Troy 8150, HP LaserJet 8100, 8100DN, 8100MFP, 8100N, Mopier 320 LBP-32X, 8150dn, 8150hn, 8150n printers. What is MICR Toner Secure? TROY’s patented anti-fraud technology forces a bright red stain to appear if chemical alteration of a document is attempted. Any solvent that will remove toner immediately releases the security agent when it comes into contact with the toner. 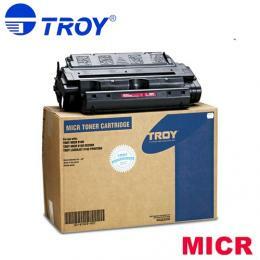 This is a Brand New (Namebrand) Genuine Troy MICR Toner. All trademarks related to Troy belong to Troy and not Laser Cartridge Plus. All Troy MICR Toners have a level of quality to meet or exceed the highest printing standards. Produced within TROY’s ISO 9001:2008 certified facility, these MICR toner cartridges are precision-matched to meet the print characteristics of each printer model.